Joseph P. Farrell, well known for his widely-discussed investigations on contemporary banks and ruling structures, co-writes this fascinating book regarding contemporary schooling with Dr. Gary La Venta. Catherine Austin Fitts wrote the forward which we publish here with permission of the authors. It took me two decades to face the enormity of what is happening in our educational system. I am an investment banker and advisor by trade. I have arranged over a billion dollars in financing for major universities and educational institutions. I served on the boards of the private school and university I attended. I served on the boards of a prestigious teachers college and the government sponsored enterprise that securitizes student loans. I started a data servicing training center and invested significantly in relational databases that informed the relationships between local education and real estate and property values. Despite those opportunities, I confess to being slow to see the writing on the wall. My wake up call started in 1998 when a group of senior employees at the CIA tried to persuade me to support George W. Bush, then governor of Texas, for President. He was going to be, they said, “the education president.” I had worked in his father’s campaign in 1988. George H. W. Bush had also wanted to be “the education president” but never seemed to get anywhere with it. It did not strike me as strange that government funded employees at the CIA were working to get Governor Bush elected. I believed that the CIA had actively worked to get Bush’s father elected Vice President after he served as CIA director. Vice President Bush was responsible for running the national security, intelligence and enforcement government lines, so I had also assumed they were instrumental in also supporting his campaign for President. So the notion that senior CIA personnel were actively working for the son just seemed to be the natural flow of events in Washington. Presumably, they had chosen education because it would help to get him elected. It was a political strategy – something to be discarded after the candidate was elected. I remember receiving e-mail at the time from a woman who worked in a senior position at the CIA. She sent me a speech that Governor George W. Bush had given on education. Wasn’t it terrific? I shot back, no, it was terrible. She replied, challenging me to explain why. I wrote back a long e-mail about what I would have said instead. Imagine my surprise several weeks later when I opened up the paper and there was an article about Governor’s Bush’s latest speech on education, including an entire paragraph essentially from my e-mail, as if it were his own. Looking back on that day, I am amazed that I did not see the dangers approaching. When litigation with the federal government meant my company had to stop financing our data servicing training and work center in a community in Washington, I was amazed at the speed at which the Gates Foundation moved in and rebranded the project as their own. But I still did not focus on the fact that private fortunes were amassing and, in partnership with the US government, were working hard in the trenches to engineer a top-down revolution in American education. A year later, I moved to a rural area and started to hear the complaints of caring, concerned teachers struggling with efforts to drug and vaccinate children and centralize control of curriculum. George W. Bush was indeed elected President and one of his first acts in office was to propose “No Child Left Behind” legislation on January 23, 2001, which was passed by Congress that year and signed into law in early 2002. I was visiting Washington at the time the legislation was moving through Congress and ran into one of the political consultants who had managed Bush’s campaign. The consultant kept talking about the legislation. I thought it odd – K-12 education was usually not something that fascinates hard-nosed political consultants. I failed to appreciate the enormity of the plans to privatize the educational system and the potential billions of dollars in stock market value that could be shifted to software, telecommunications and technology companies, among others, much of it at the cost of labor, local control and the quality of our children’s education. Focused on mortgage and financial fraud, it was not until the accumulated concerns of teachers whom I knew personally became pronounced that I started to pay attention. Scores of committed teachers were resigning and leaving the profession. Their reports regarding drugging of children and the impact of standardized testing were alarming. I was – and am – deeply concerned at how invasive digital systems have become in all aspects of our lives and economy. This includes the use of entrainment and other mind control technologies delivered by media and telecommunications. It also includes surveillance and the invasion of privacy documented by numerous NSA whistleblowers and Edward Snowden. Whatever they are, digital information systems are not to be trusted when it comes to both children and adults. That is when I started to research what was happening in education and found in Dr. Joseph Farrell and Dr. Gary La Venta, scholars and teachers I could trust to understood both what was happening in the classroom and to help me connect it to the bigger picture. 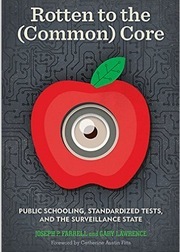 The same process is underway with the mandating of the common core curriculum and standardized testing in grades K-12. This begins the reengineering of the education process that will significantly reduce the need for and the authority of teachers. Federally mandated reforms, if successful, will permit corporations to assume profitable ownership and control of a much greater portion of the education system: everything from software and online systems to the construction and management of charters schools. If federal legislation mandates vouchers that carry an obligation to use federally regulated curriculum, corporate involvement will likely explode. Classrooms and online systems will soon provide direct access to children by large corporations and intelligence agencies. With the ability to integrate these flows with those coming from health care records and financial systems, the real harvesting begins. When you look at the potential that the reengineering of health care and education systems has to create monopoly profits – both income and stock market value – you can appreciate some of the economic reasons why the US leadership wanted the general population over a financial barrel. Whether deeply in debt or financially dependent on government subsidies (which are financed by debt sold to their pension funds), we are witnessing another form of leveraged buyout – one that gives highly centralized control of our children and their education to invisible forces. If you are a parent with children in public K-12 schools in the United States, it is more important than ever to ask whether your children are spiritually, intellectually or physically safe as they participate in the new educational surveillance state. Whatever the answers, you are mandated to fund this siege on your children through your property taxes. The reason that I am concerned for the safety of your children is because the educational surveillance state is a plan. There is a plan at the highest levels. The plan has been engineered at great expense and effort over several decades. The plan is engineered to give direct access to your children to large corporations and intelligence agencies. It is engineered to provide that access without the intervention of teachers and school administrators that have the independence and authority to ensure nothing harmful happens. One thing I can assure you is that the history of giving direct, unsupervised access to young children by large corporations and intelligence agencies has never turned out well. What do you do? Do you send your children to a carefully screened private school? Do you home school? Do you leave the country? I don’t know. You will have to answer that question based on your unique situation. What I can tell you is that thanks to the fearlessness and intellect of scholars and teachers such as Dr. Joseph Farrell and Dr. Gary La Venta you are armed with the knowledge you need to ensure a successful education for your children – now while there is still time to do so.